A small village in Lincolnshire, just outside the town of Market Rasen. March 29th The School closed for the stone-laying of the New Wesleyan Chapel, which was built on the site of the old pub. April 2nd Census – Listed 205 houses and 9 uninhabited houses 350 males and 361 females of all ages, total 711. May 24th Empire Day, the school children celebrated it in style. June 6th Rev. Arthur W Tryon died. Kelly’s Directory of 1913, listed Middle Rasen residents, using this information; Crops gown are wheat, barley, turnips, and pasture. Sexton is William Codd. Sub postmaster is John Rands. Council school head master is Harry E Hodgkins, the average pupil attendance is 79. There are 25 farmers, 13 cottage farmers, 3 cow keepers, 3 grocers and 6 ladies of private means and 3 gentlemen listed in the Kelly’s directory of 1913, plus the following; a painter, carrier, assist overseer, tailor, wheelwright, jobbing gardener, water miller, wind miller, blacksmith, machine owner, pig dealer, shoemaker, bookmaker, shopkeeper, and poultry dealer. July 28th War was declared and the men of Middle Rasen left the village to “do their bit” for King and Country. The men already serving and the Reservists were in France within days. Oct. 19th War came to Middle Rasen, George and Marion Bell, Ivy Cottage were informed that their son Arthur E BELL had died of disease whilst on duty in Chatham, Kent, with Royal Marine Light Infantry. Nov. 1st Charles Watson CARR was born in Middle Rasen and living in Wragby. He was an Army Reservist and joined the 1st Batt Lincolnshire and died on November 1st. Nov. 23rd Mr Hodgkins Middle Rasen School Headmaster becomes a Special Constable. Market Rasen Mail listed each week the names of the men from Market Rasen and the surrounding villages who had just enlisted. 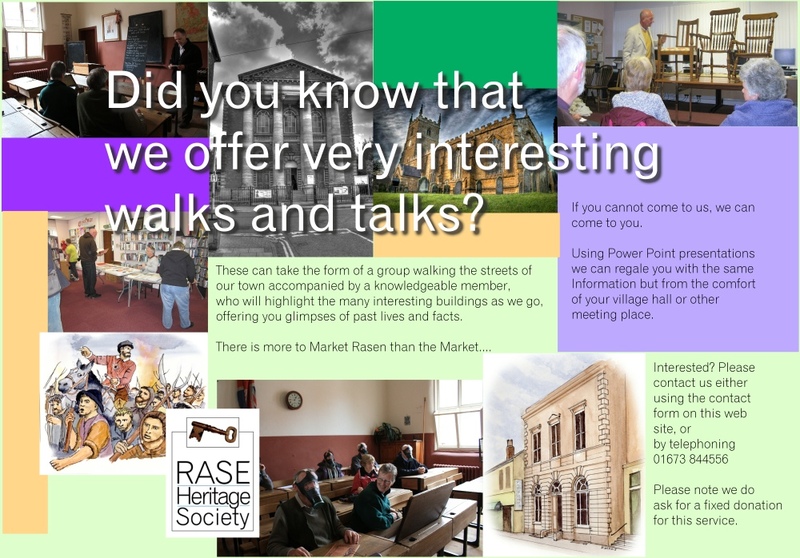 Roll of Honour listed in 13th February – Market Rasen Mail (MRM). 21 names of young men serving in several different Lincolnshire Regiments, Royal Engineers, 6th King’s Royal Rifles, Royal Marines, Royal Fusiliers, Coldstream Guards, Grenadier Guards, Royal Army Medical Corps, Royal Flying Corps, Roy al Navy, and Royal Field Artillery. March 12th “The scholars have collected 100 eggs and they have been forwarded to the Military Hospital in Lincoln for the use of the wounded. A letter of thanks has been received from the matron” On April 1st a further collection of 250 eggs was sent. Middle Rasen School Log. May 11th School closed at 11.45 to allow the children to see the soldiers at the Recruiting meeting at Market Rasen. June 18th School closed to go and see a Company of 5th Lincolns who were on a recruiting march. Aug. 12th Ben Goulsbra leaves for France with 7th Lincolnshire Regiment. Oct 10th Bert Cottingham left Middle Rasen and joined the Royal Flying Corps as a 1st Class Air Mechanic. Sometime during this period Captain GA Tryon was awarded the Military Cross and mentioned in Dispatches. March 2nd Private George F PRESCOTT, 7th Lincolnshires was Killed in Action. March 31st Philip Storr was discharged due to his wounds, awarded Silver War Badge. Tom Frildington is in Malta and he sends a letter to his mother stating that he has Influenza. May 9th Private Herbert BELL, Coldstream Guards was Killed in Action. June 13th School Concert in aid of the Relief in Belgium. They raised £7 11s. 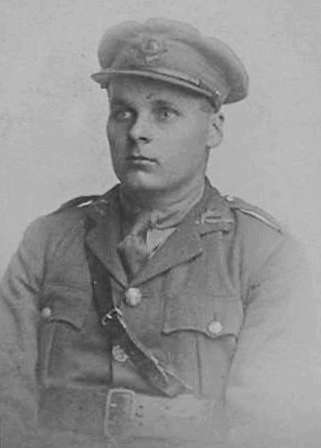 July John Thomas Woodcock, wounded at The Battle of the Somme. Sept. 27th Boy Telegraphist Thomas SHARP, RN HMS MANUTA, died of disease and is buried in Glasgow. He was 17. Oct. 24th Staff Sergeant Charles Henry Edmund BLACKBURN, R.A.M.C died in Malta. April 23rd School Teacher Mr George Burwell left to carry out military duties. May 4th Private Charles William FIELDSEND, Leicestershire Regiment died of his wounds in France. Private John SHARP, Royal Warwickshire, was Killed in Action. May 9th An aeroplane had crashed near the school. May 15th Bert Cottingham was mentioned in Dispatches in the London Gazette. Herbert Swaby returned home from the Front to marry Lily Ward in Scunthorpe. June 26th George F Swaby, commission 2nd Lieutenant in 6th Duke of Wellington. June 28th School had a fête for Soldier’s comforts after lessons. 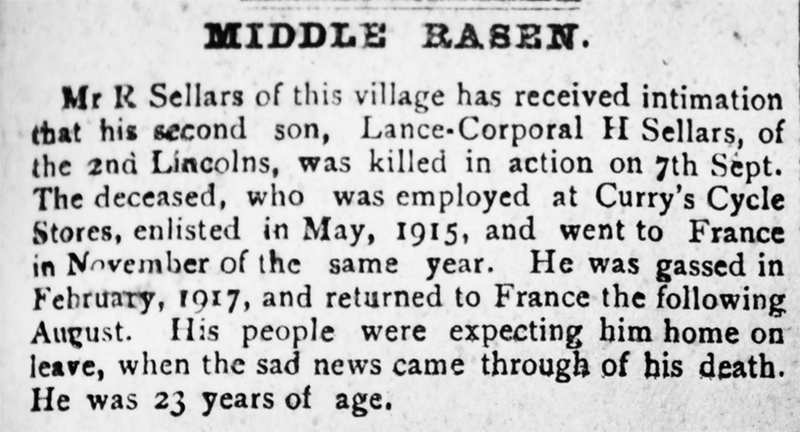 July MRM 7th July 1917, reported on the Fête in Middle Rasen. To raise funds for 60 men serving, it was organised by the 4 churches; St Peter and St Paul Parish church, The Wesleyan Chapel, The United Methodist Chapel and The Primitive Methodist Chapel. July 26th Private Charles SMITH, 6th Lincolnshire’s, died of heart failure. He was living in Market Rasen and is remembered on the Town Memorial. August 28th Cyril D Naylor got a commission 2nd Lieutenant and transferred to 7th Lincolnshires. Harold Rawlinson discharged as unfit with deformed ankle. Sept. 10th John T Woodcock discharged as unfit due to wound in thigh. Awarded the Silver War Badge. Nov. 19th 24 children had school meals. December School children and Teachers collected £1 4/8d from subscriptions, for the Overseas Club Fund. Feb. 16th Ben Goulsbra is transferred to RASC Private M/3777078 from 7th Battalion Lincolnshire Regiment. May 10th Daniel Hildred is discharged with Silver War Badge. May 27th Use of slates is increased due to the scarcity of paper. June 17th Mr Hodgkins was away from School, he had been on Military work in Louth. July 29th 2nd Lieutenant CD Naylor was awarded the Military Cross. August 25th 2nd Lieutenant Cyril Doughty NAYLOR was Killed in Action. 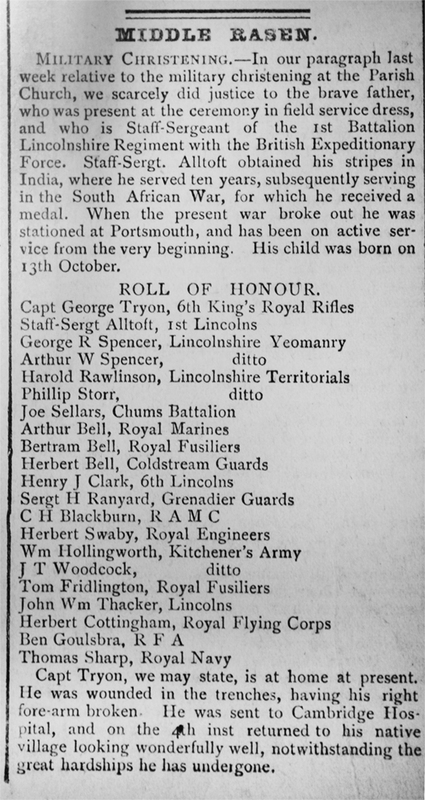 Sept 7th Lance Corporal Harry SELLARS , 2nd Lincolnshires was Killed in Action. He was 23 years old. Nov. 7th Captain George Arthur TRYON was killed by a single bullet during the attack towards Maubeuge, near St, Aubin. Dec. 2nd Lieutenant GF Swaby home for Christmas. 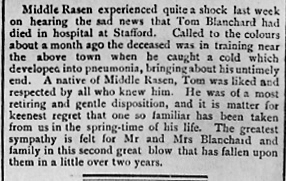 Feb. 6th Thomas A Dent demobbed to Market Rasen. June John Alltoft, Silver War Badge; George Garner to Market Rasen. July 19th ‘Peace Celebrations were carried out in the school and adjoining field. 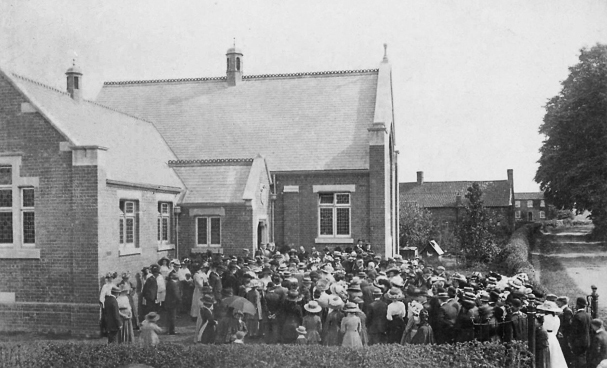 The school children of the Parish and adults were entertained to tea in the school room. This was followed by sports for all classes’ School Log. Nov. 7th School hosted an event to welcome ex-service men. Sept. 25th Middle Rasen War Memorial is situated on the east side of the porch, and made of white marble. It was unveiled and dedicated on 25th September 1921. Oct. 1st Full report in Market Rasen Mail – Unveiling of the War Memorial in St Peter and St Paul’s Church, Middle Rasen. Unveiled by ex-Sergeant. G Garner of K.R.R. Lieutenant G Swaby led a large contingent of ex-service men in a parade around the church. Rev Ernest Hutchins gave a moving speech on duty. At end of service G Garner played the last post. There are two private memorials erected by their mothers about this time. St Peter – George A Tryon..